Use our very popular WildPets Ear Trouble Drops below to address these problems for your dog, cat or pet. If chronic ear problems, chronic ear infection, chronic ear infestation are a constant companion to your pet, despite pet drug medication and/or natural pet remedies, then it is likely just a manifestation of deeper health issues, especially if your pet animal has various other chronic health problems. Use our WildPets Ear Trouble Drops to address immediate symptoms that irritate and annoy your pet, and order our Holistic Pet Wellness Consultation to address the sources of the symptoms such as diet, lifestyle, nutritional and organ imbalances, to ensure long term vibrant health, ear health and quality of life for your canine, feline and animal friend. A 100% natural pet remedy for ear problems - excess ear wax, gunk, pus, discharges, foul odour, itching, irritation; ear parasites, ear mites, fleas, lice, ticks, insects, ringworm, yeast, fungus, bacteria, virus; ulcers, sores, eczema, crusts; minor injuries; ear ache, infection, inflammation; and resulting hearing difficulty. This homeopathic, vibrational essences and energy blend is antiseptic and deep acting. 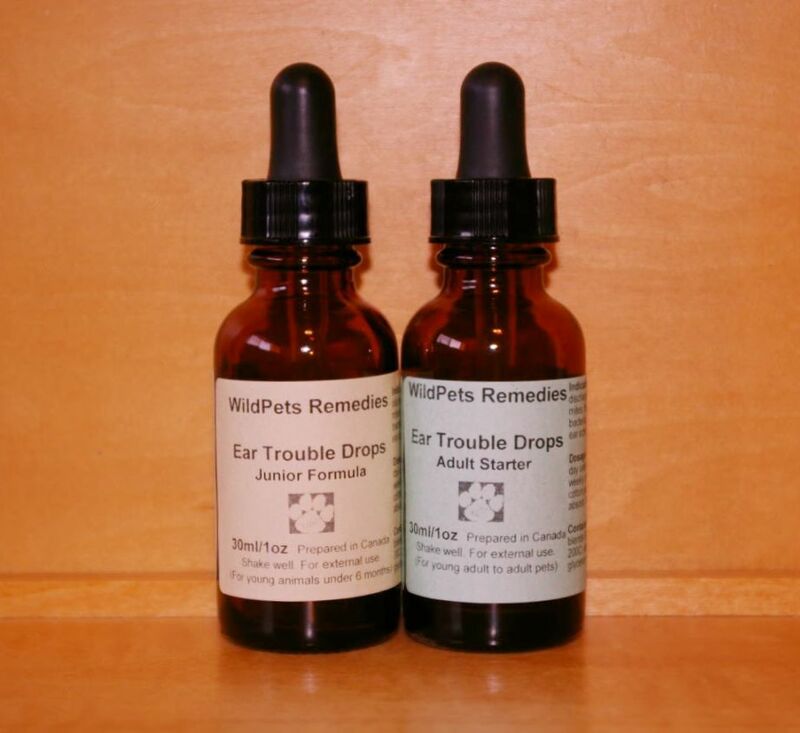 This remedy is designed based on extensive experiences working with animals with ear problems, seeing how pet ear remedies that address only the superficial symptoms are not enough help for chronic ear problems, so we address deeper systemic imbalances with our WildPets Ear Trouble Drops. Prevent common fungus, yeast, bacteria and ear mites with our healing pet ear drops. For prevention, apply these drops to the ears of your dog, cat or pet once a week, as needed (e.g. after a swim) and for pets prone to parasites and infection. Our holistic pet ear drops has no artificial colors, fragrances or preservatives. It contains no aromatherapy essential oils, making it safe for cats, puppies, kittens, smaller pets and those with a weak or small liver. This remedy also contains no oils which can gunk up the ears over time. This product is safe to ingest but is designed for external use. Ingredients: Proprietary preparation of homeopathic blends Ear Gunk, Ear Bugs, Ear Ache, Ear Infection; vibrational essences blend, malic acid, vegetable glycerin in arg-c 10ppm solution. Suitable for dog, puppy, cat, kitten, rabbit, horse, pony, pig, farm, wild, zoo and all canine, feline, equine and pet animal with similar symptoms. How does this home pet ear remedy help your pets, cats or dogs? lubricates, moisturizes, softens and breaks up hard crusted ear wax, dried up ear gunk, ear discharges so they can float to your pet's outer ear to be expelled and removed by cotton pad, facial tissue or finger tip. 1oz/30ml liquid dosage bottle Fast absorption for quick action. Liquid dropper included Convenient application. Most pets prefer gentle drops to surprise sprays in the ear. WildPets BIO Booster 5-in-1 Nutritional Therapy Not just a supplement! Advanced formulation to supply your pet's body with 30+ 'live' functional foods designed for nourishment therapy. Full spectrum nutritional supplement, gentle detox, immune builder, natural pH balancer and body tonic all-in-one remedy. No filler, no synthetic stuff. "Mitzi is doing VERY well. Her ears are completely clear. After all the help you have given us, to see our little girl so full of life, her ears are clear and her skin is not driving her crazy, ALL because of you and your wonderful products. The puppy mill did not win this time. We are just very grateful." "Hi Pearl, I think your site is wonderful, I previously purchased the ear mite remedy and it worked! Keep up the excellent work. We acquired a new puppy into our home with two older dogs, low and behold the infections began. I hate to see my babies suffer so I'm glad to have stumbled onto your site." "I have administered the ear drops, which seem to be dislodging a lot of stuff, as I have cleaned her ears out with Qtips. Her ears have improved, I am giving her the drops maybe every day or every other day."